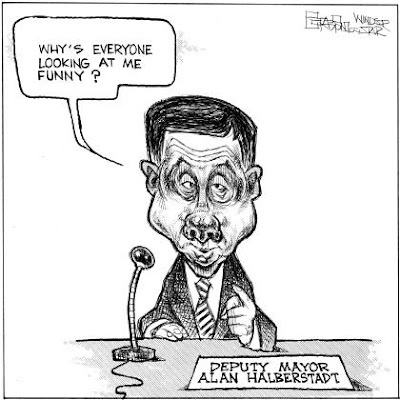 I'm just glad that someone at the Windsor Star can see through Councillor Headlines. 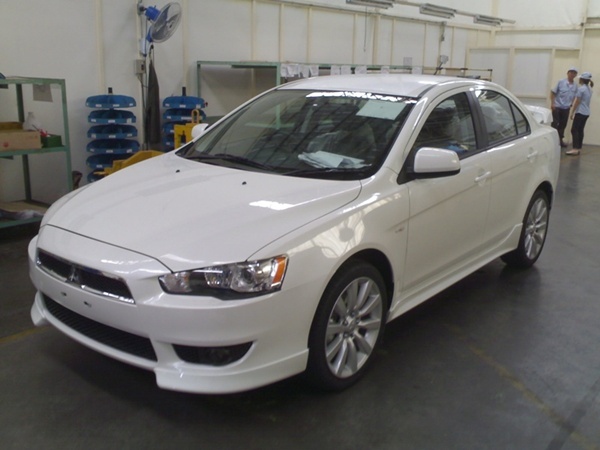 I rented a Mitsubishi Lancer for a quick in and out to the big smoke. The car was pretty zippy and a little buzzy, but a pretty smooth ride to Toronto and back the next day. Great - handling and responsiveness. This car will get you through the multiple lane changes at top speeds, especially when you make the curve at Milton and the pace picks up so you can blow out the speed limit until you hit that dead crawl by the airport. It's well balanced and firm, and a comfortable ride. Good - the mileage. Just under 9 litres per 100 km on the way to Toronto with full air blasting, and just under 8 litres per 100 km on the way back to Windsor with air off and defrost and wipers working. The rent-a-car dude insists that heating uses more fuel than A/C, and I'll buy that because he said so and who likes to argues with a twenty-something in a tie? Room for growth? Interior design. The cockpit is bland and the dashboard is flat. Reaching the buttons for the radio has you reaching across almost to the passenger zone, and necessarily taking your eyes off the road to do it. The inside is boring and not driver-centric, and that electronic display is small and neon orange. It makes all the typical Japanese tweets and bleeps if you're into that sort of thing. Would I buy it? Nope. Nice car, good quality no doubt, and it will be past it's design expiry date and headed towards yesterday's look before you pay it off. This is the year of the priest. We’ve mentioned that a few times over the course of the year, and from time to time we’ve taken time out for a special prayer for priests, but never really talked about it. Let’s. Perhaps, as the year winds down, we should talk about it today. It’s appropriate to today’s Gospel of visible love for all believers, a love that can be seen even by outsiders. A love that sets us apart. We’ve had plenty of reason to think about Priests lately, particularly with the ordination of two men last weekend. Father Patrick Beneteau and Father David Butler were Ordained to the priesthood at the Cathedral in London, and a good number of the faithful showed up to, well, quite frankly, cheer them on. It has been four years since the last priestly ordination in our Diocese, so having two bright young men called to Holy Orders was a welcome relief, and quite a celebration. After the Ordination you could hear people saying things like “alleluia” and “thanks be to God.” We value our Priests and we know how important they are to our faith lives. Perhaps you read about Father David and Father Patrick in the Windsor Star last Monday. It was quite a nice article and they both articulated their vocation in what I hope is a very inspiring way. Young men today would do well than to follow their example of courage and determination. Catholic families today would do well to emulate the Butler and Beneteau families in offering the Priesthood as a possible answer to God’s call in the hearts of their sons. In our Diocese there is a place for the call to be realized in St Peter’s Seminary. In fact, in this particular crop of seminarians there are still 4 more to be Ordained by the end of June; men who studied in London but will be ordained by their own Bishops in Calgary, in Thunder Bay, in Hamilton and at the Chaldean Church here in Windsor (the former Immaculate Conception). A couple of weeks ago I spent my annual retreat with the Seminarians at the Holy Family Retreat House in Oxley, one of the other jewels of our Diocese. IN the London Diocese we offer the faithful many ways to celebrate, nurture and grow the faith that most Dioceses across Canada can’t match, the Seminary and the Retreat house being just two of the unique legacies left to our care by the faithful who came before us. During the retreat we spent almost 8 days in complete silence, except for each day at Mass and at morning prayer, or praying the Rosary together at sunset, and at our our daily meeting with our Retreat Director. It’s funny, but even when you are in total silence, when you can’t say a word, when even meals are shared in complete silence without even eye contact or a little smile, a wave, a gesture – all forms of communication that could interrupt another’s prayer – even with all that silence a great fellowship is formed. The Holy Spirit was indeed at work, not just in the men to be ordained, but in the 20 or more Seminarians from across Canada discerning their call, and in the Permanent Deacons who were on retreat as well. My friends, make no mistake. There may be cause of concern for our church, but it’s reason for prayer, but not for despair. Hope abounds. Sure, I know that the press hasn’t been favourable for the Catholic Church, our Holy Father and for our Priests lately, but have you noticed a turn in the right direction lately? Last weekend an honest but supportive editorial in favour of the Catholic Church, and then the article about the Ordination, and just this weekend a letter from a reader in support of the many, many, many good priests out there, and my friends, right here with our own Pastor, Father Kornacker. Pope Benedict XVI, in proclaiming a year for Priests, quoted a real priest’s priest, St. John Vianney when he said “A good shepherd, a pastor after God’s heart, is the greatest treasure which the good Lord can grant to a parish, and one of the most precious gifts of divine mercy”. Explaining to his parishioners the importance of the sacraments, Saint John would say: “Without the Sacrament of Holy Orders, we would not have the Lord. Who put him there in that tabernacle? The priest. Who welcomed your soul at the beginning of your life? The priest. Who feeds your soul and gives it strength for its journey? The priest. Who will prepare it to appear before God, bathing it one last time in the blood of Jesus Christ? The priest, always the priest.” These words, welling up from the priestly heart of the holy pastor, might sound excessive. Yet they reveal the high esteem in which he held the sacrament of the priesthood. “The priest is not a priest for himself, he is a priest for you”. 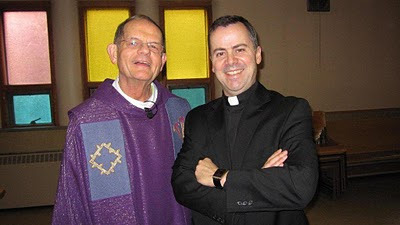 This Priest, a priest not for himself, but for us, Father Bill Kornacker has been a priest for 42 years, a real priest’s priest in the most humble sense of the word that I can imagine. He is infused with a love for the poor through his love for Christ, and his personal mentorship as I studied to be a Deacon has been invaluable. Father Bill has just this weekend officially announced his retirement from active parish and pastoral ministry. There will be plenty of opportunity to formally express our gratitude between now and the beginning of July, but if you pick up today’s bulletin you will notice a beautifully written letter from Father Bill announcing his retirement. As he reminds us, a Priest never really retires from his vocation, but there does come a time to serve God in other ways that include a well deserved rest. I invite you to pray on those words. Today’s Gospel speaks of love. Christ says he gives us a “new” commandment. Why does he say it is new, when it is clearly so old? Or is the commandment new because it divests us of our former selves and renews us? Love does indeed renew the person who hears and obeys its command, but only that love which Jesus distinguished by the qualification, “as I have loved you.” Our Priests, our Bishops, live their lives and sometimes give their lives in that very love, expressed for us in the Sacrament of the Eucharist. I do invite any young man in this parish who is considering a vocation to the Priesthood, or for that matter any man who may be feel called to learn more about the Permanent Diaconate, to grab a bulletin, my email address is on the front page. Send me an email. I’m good for breakfast. I hope you like pancakes.